At the recent (and possibly the best) Notwestminster event I held a workshop on designing council committee meetings. I’ve been interested in how seating arrangements can affect the quality of meetings for a while so this event, with its rich mix of participants, was the perfect opportunity to share some ideas and get people working on them. The starting assumption for the workshop was that council meetings are like theatre. In fact the theatre metaphor provides a nice language for talking about meetings — you have the lead actors and a range of supporting actors, you have the stage and of course you have the audience. Perhaps the most interesting thing is the idea that the officers that support meetings can be thought about as set designers — this opens up the real possibility of moving away from ‘the way we have always done things’ to designing something better. From some research I’ve been doing with Catherine Farrell at Cardiff Business School and Matt Wall at Swansea University (we are writing a paper on this topic — did I mention?) it seems there are a number of soft rules that can be applied to seating arrangements. The rules are ‘soft’ as they haven’t really been scientifically tested and certainly not in the council setting. Size — smaller meetings are better for deliberation and the biger the better for diversity (the audience can then more likley to see ‘people like them’ represented). Between 5–8 seems to be the best for team working. Shape — open shapes (like top tables and senate hearings) are better for transparency as evryone is facing the public. Closed shapes, like ovals and rectangles (board meeting style) are better for working together. Position — while sitting next to each other is better for co-operating and sitting within 4 feet promotes freindly co-operation, so having a distance of 12 feet or more promotes a more formal interaction. The interesting thing for us as researchers is how different configurations promote different aspects of governance. So, for example, if you want to show transparency, you need a different set up to if you want to show accountability, or policy deliberation or participation etc. In the workshop I wanted to try out some of this. After sharing something about these soft rules I gave the participants a scenario of a meeting with some different agenda items (cabinet member Q&A, discussion with the public, closed conversation for the committee). I then asked them to build the ideal meeting layouts for each item seprately and one that would work best for all three items. We need to feel free to move the tables around more — even in the middle of meetings — many committee tables are already on wheels so what’s to stop us? 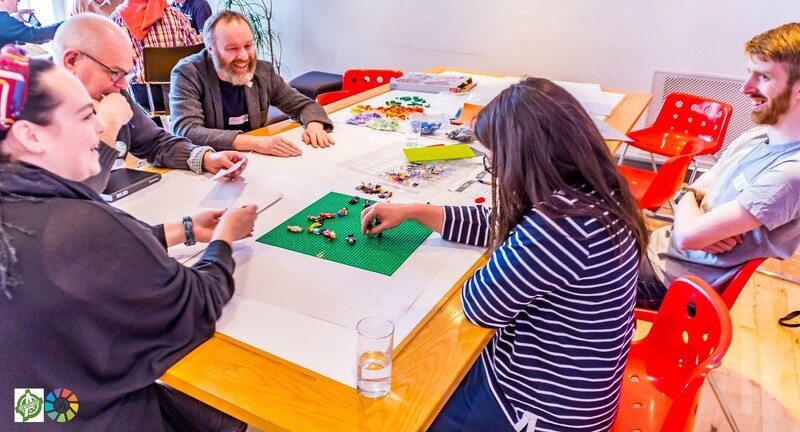 Using lego to design meetings is great! We should all do it! My overall takeaway is that, given the chance, people can be incredibly creative about meeting design and that there are many more ways of setting up a council meeting than the ways we are used to. PS. we are writing a paper on this, inclusing the results of a survey, so hope to share something soon.